The majority of the world’s population can’t start their day without a cup of coffee in the morning, me included. Depending on who you ask, coffee can be the elixir of health or a toxic drink you should avoid at all costs. It’s rich in antioxidants which make it healthy and beneficial for many medical conditions. But, on the other hand it contains caffeine, a stimulant which can easily lead to sleep disorders and an array of other problems. This article is dedicated to finding the truth and determining the positive and negative aspect of coffee drinking. It’s delicious and makes the morning easier, but is coffee bad for you? Let’s find out! You may think what’s 1% or 3% of something; coffee has no nutritional value after all. But think about how many cups of coffee a day you drink. Multiply these numbers by the cups you drink and you’ll get some pretty high numbers, don’t you think? You could satisfy half of your daily needs for essential nutrients. Leaving aside the abovementioned nutrients, coffee’s biggest plus is its high amount of antioxidants. Just to make things clearer, a person with an average western diet gets more antioxidants from coffee than from fruit and vegetables together. Coffee is also the richest source of caffeine; the most consumed psychoactive substance around the globe. Just one cup of coffee can contain about 30-300 mg of caffeine, depending on the size of the cup. Caffeine stimulates the brain, obstructing the function of Adenosine (an inhibitory neurotransmitter), while boosting the production of dopamine and norepinephrine and increasing brain activity. So is coffee bad for you or does it only boosts your metabolism? This process makes us more energized and alert, preventing feeling of tiredness and exhaustion. According to a number of studies caffeine can boost our brain function (short-term), improve the overall cognitive function and make us feel better. Maybe you didn’t know, but caffeine is also an excellent metabolism booster, it increases the number of burned calories by 3-11 % and improves the work out performance by 11-12% on average. However, if you are a regular coffee drinker you might not feel all the benefits because some of the effects are temporary and you can become tolerant to it. Certain studies have also shown that coffee drinkers have a lower risk for developing type 2 diabetes by up to 23-67%. This disease is so widely spread these days which is why this information is crucial for people who have diabetes in the family. According to one major study which reviewed 18 studies involving 457,922 subjects, every cup of coffee during the day decreases the risk for type 2 diabetes by 7%. 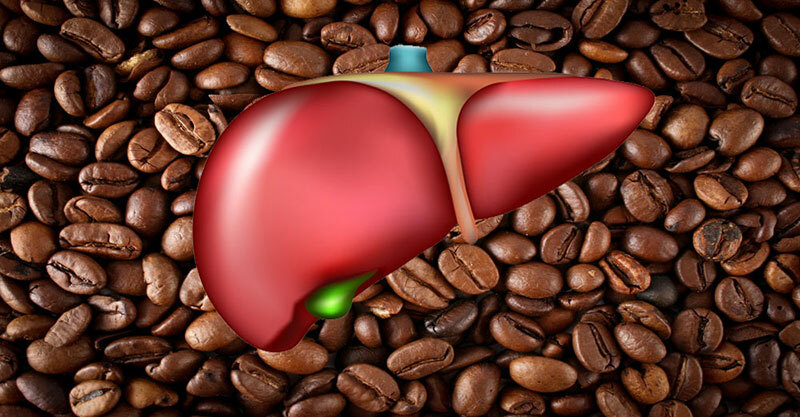 It’s not just diabetes that coffee protects us from, but liver diseases and cirrhosis as well. This is also very important if we consider the fact that the liver is one of the most important organs in our body and has a major role in a number of bodily functions. Drinking coffee can decrease the risk for cirrhosis by up to 84%. It can also decrease the risk for developing liver cancer, which is the number 2 leading cause of cancer death on a global level. Regular coffee drinking can lower the chances of liver cancer by 40%. In order to take advantage of all of coffee’s benefits you’ll need to drink 4 or more cups of coffee a day. Regular coffee consumption is beneficial for the brain function as well, especially in older people since it can lower the risk of developing age-related neurodegenerative diseases like Alzheimer’s and dementia. Studies show that regular coffee drinkers have a 65% lower chance of developing Alzheimer’s and 32-60% lower chances for Parkinson’s disease. When it comes to these diseases, the more coffee you drink the better. Another thing coffee can help with is depression. Studies indicate lower chances of depression and suicides in coffee drinkers, which is something we need to take into consideration if we know that depression is the leading mental disorder worldwide. A 2011 Harvard study revealed that the subjects who regularly drank coffee had lower chances of getting depressed and commit suicide, by 20% and 53% accordingly. We can conclude from everything above mentioned that coffee drinkers have a longer lifespan since drinking coffee reduces the risk for developing a number of life-threatening diseases. The New-England Journal of Medicine published a 13 yearlong study in 2012 with 402.260 subjects aged 50-71. The study looked into their habits and discovered subjects who drank 4-5 cups a day had significantly lower risk of dying, by 12% for men and 16% for women. Coffee has many benefits indeed, but it can also have some negative effects on your health, and lead to sleep disorders and anxiety issues. Is coffee bad for you? Well too much caffeine can lead to anxiety, jitteriness, heart palpitations and can even worsen panic attacks. If it’s causing you difficulties falling asleep you might want to stop drinking coffee late at night. If you’re not accustomed to coffee it can cause some other problems as well, like increase the diuretic and blood pressure. You shouldn’t forget that caffeine causes addiction and it can lead to tiredness, irritability and headaches, but after a while you’ll get used to the symptoms and won’t feel them anymore. Since it’s highly addictive if you stop drinking coffee you’ll go through a withdrawal and feel tired, irritated, you can experience headaches and brain fog for a few days until your body goes through the process. All of these symptoms indicate addiction to caffeine. Since hearing about the caffeine addiction a lot of people switched to decaf and think they’ve got nothing to worry about. Decaf coffee is made out of the same coffee beans which are just stripped of the caffeine by rinsing them with solvent chemical a few times before they’re brewed. This process almost completely eliminates the caffeine but there is still some left behind. Moreover, the above mentioned benefits don’t apply to decaf there has not been any evidence that it can help with liver disease, diabetes or Parkinson’s. So you need to know what kind of coffee to drink in order to take advantage of the benefits and stimulate its healing properties. Firstly, you need to steer clear of everything processed, like adding sugar or artificial creamers to your cup. And avoid these modern versions of coffee which can have more calories than a double burger. Stick to the regular black version and you use paper filters to brew it because unfiltered coffee like Turkish or French press contains cafestol and raises your cholesterol level. Pregnant women should avoid drinking coffee while insomniacs, people suffering from high blood pressure and anxiety should try to cut back on the consumption. In conclusion, we can all agree that drinking coffee has an overall positive effect on your entire organism and if you’re a coffee maniac you surely agree that the benefits outweigh the negative aspects of this ever-so-popular drink. As we can see from all the studies listed above, coffee can have a very positive impact and improve your health significantly which is why many consider it to be as beneficial as green tea. We gave you the facts and numbers, it’s up to you to decide is coffee bad for you or not!